"Maine, J. Gary Nichols Cemetery Collection, ca. 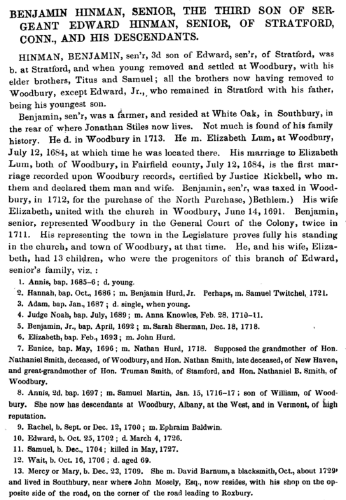 1780-1999," database with images, FamilySearch (https://familysearch.org/ark:/61903/1:1:QKXM-QPMG : 9 October 2015), Sherman Hines, ; citing Washburn, Aroostook, Maine, United States, Cemetery Riverside, Maine State Library, Augusta; FHL microfilm 2,148,875. 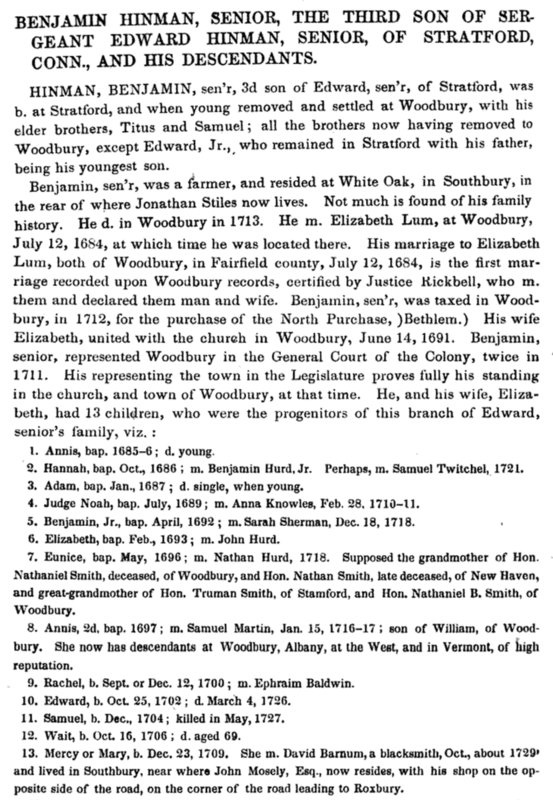 Connecticut Marriages, 1640-1939, database with images, FamilySearch (https://familysearch.org/ark:/61903/1:1:F7PG-TQK : 12 May 2016), Abner Hinman and Caroline R. Holt, 22 Feb 1849; citing Norfolk, Litchfield, Connecticut, United States, Connecticut State Library, Hartford. ; FHL microfilm 1,503,193. 1850 United States. Census Office. 7th census, Population schedules of the seventh census of the United States, 1850, Washington, District of Columbia: National Archives. Central Plains Region, (1964) , Census Place: Augusta, Oneida, New York; Roll: M432_562; Page: 7A; Image: 19. Adin Vincent Hinman, A History of the Hinmans, Containing Also an Abbreviated Record of the Kindred Families, , at https://archive.org/details/historyofhinmans00hinm . Youngstown, O.: The Vindicator Press, (1907) , p. 12. Abner Roys Hinman was born on August 5, 1854. He was the son of Abner Hinman and Caroline Roys. Record added: Jul 02, 2009. Royal Ralph Hinman, A catalogue of the names of the early Puritan settlers of the colony of Connecticut: with the time of their arrival in the country and colony, their standing in society, place of residence, condition in life, where from, business, &c., as far as is found on record, , at https://books.google.com/books?id=KTkBAAAAYAAJ . Hartford: Press of Case, Tiffany and Company, (1852) , p. 832.